Yesterday, whilst out with friends (more on that in tomorrows post) I received a very exciting email. "How was your weekend? I have some good news for you..
As you may or may not know, every month we pick out a blogger who we think has done really great posts featuring Next. 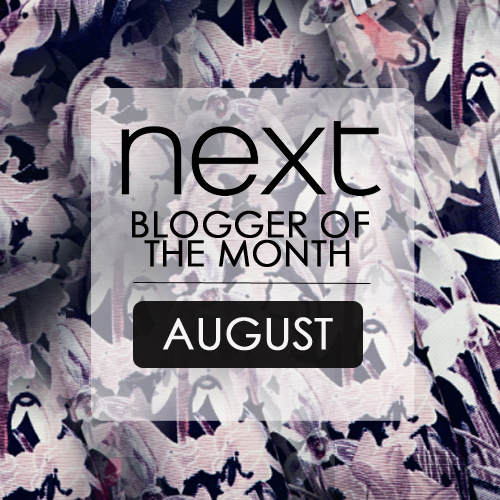 We wanted to nominate you as our Blogger of the Month for August as we have LOVED reading your great posts over the last few months featuring items from Next!! We are a fan of your blog and reckon you are most deserving of this accolade." This blog is a tiny little piece of the web that I put ALOT of effort in to. So to get some lovely recognition like this was absolutely amazing! Thank you to those of you that follow, read and comment on my posts, I really appreciate all the support!